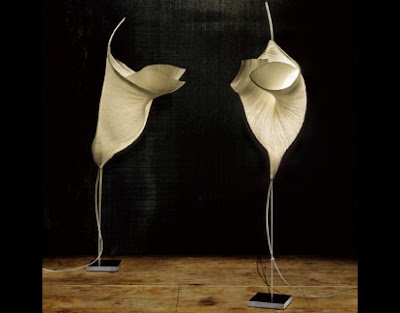 German born Ingo Maurer is one of the most prolific and respected artist/designers working today. 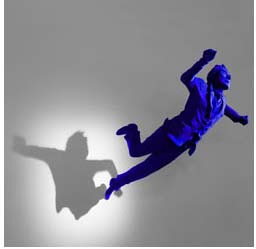 Fascinated by what he calls the magical and mystical properties of light, Maurer constructs luminous atmospheres that play with traditional concepts of color, brightness and shadow. Since 1966, Maurer has created more than 150 different lights and lighting systems for private commissions, fashion runways and public buildings. 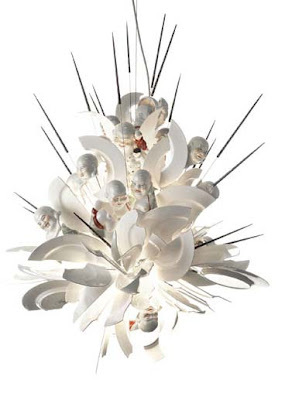 He uses unexpected materials and found objects to create light. He is also a pioneer in the usage of new lighting technologies. Pictured above is Maurer’s Mamo Nouchies series. This series reflects the artist’s fascination with japanese paper and his deep respect for japanese art. The name mamo was created by using the first two letters of Maurer’s last name, combined with the first 2 letters of his collaborator, Dagmar Momback. Momback developed a technique for transforming paper that gave life to Maurer’s creative vision. The name Nouchies was a pun on Noguchias. The pair wished to pay homage to the japanese designer and artist Isamu Noguchi. Noguchi’s ideas were based on a traditional japanese craft involving paper called akari. These poetic forms are paper folded around paper illuminated from within. The pieces enchant the space around them with a soft dancing radiance. 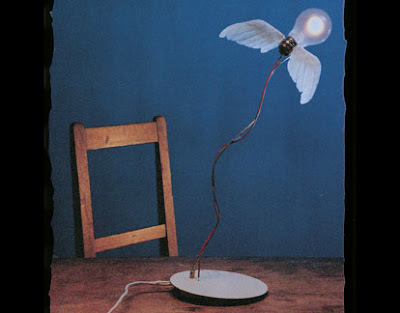 This next photo is one of Maurer’s best-known fixtures called “winged light bulb”. 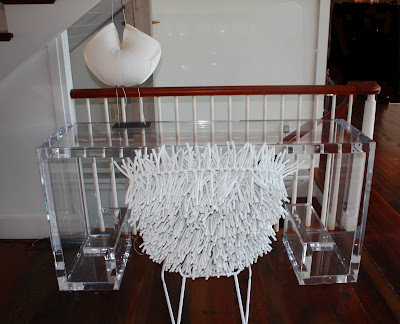 This piece crossed over from design to contemporary art. He playfully takes iconic images and transforms them into a visual pun. 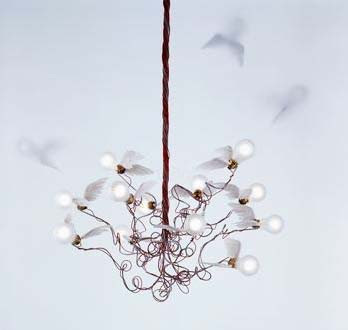 The series can be seen as a single bulb, or clustered together as a chandelier with movable wires to create a flock of birds aptly named “birdies”, shown below. In my portfolio here you will see one of the Mamo Nouchies as well as one of the clustered winged bulbs. The clustered chandelier bulbs were playfully used in the eaves of a foyer in a farmhouse that is surrounded by glass windows and trees. The birds look as if they are flying towards the trees when you are standing in the entryway. The most faq’s about lighting…….. Most people have never heard of a lighting designer. I enjoy working with them. Once a floor plan is created by me, my lighting designer will create layers of light in a space that will not only give you general lighting but provide mood and drama. It is important to have color, texture and harmonious shapes in a room. The addition of well placed lighting has the ability to enhance these features and add visual depth to the interior . Depending on what level of design you are looking for, many companies offer this service. 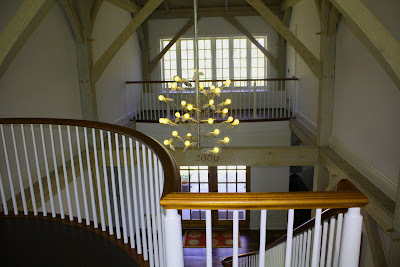 http://www.olc152.com/ is one example of a design firm that has lighting specialists to meet your needs. How do you know what size chandelier / multiple pendant lights to hang over a dining room table? This is the rule of thumb..... the size of the chandelier over a table should not exceed 1/2 the width of a table. If your table is 44", the diameter of the fixture should be around 22". With regard to multiple pendant lights over a table, island, or bar remember the following.... measure 12" in from each end of the surface, then center the first pendant and place the others at equal distance from the center fixture. whether you are hanging a chandelier or pendant over a surface, it should hang 30-36" above it. Color temperature is the yellowness or blueness of a light source. a yellow light is a cooler light and a white or blue light is a hotter light. What types of lighting should be used in a room? General lighting illuminates the entire room with either artificial light or natural light. Task lighting gives you the ability to illuminate specific areas for work. For reading, a lamp shade should hit the shoulder level. Accent lighting will add mood and drama to a room, focus on artwork or illuminate specific architectural features. What types of bulbs should be used and what is the most energy efficient? Incandescent bulbs are the most common and what we most often think of as a "regular bulb". These bulbs use a light source created by a tungsten filament. It produces a desirable yellow light. They are not very efficient because it uses too much heat to create the light. Halogen bulbs are also type of incandescent, but are more energy efficient than the tungsten incandescent. They produce a higher color temperature and a whiter light. Colors in a room appear more vibrant. Compact fluorescent bulbs (cfl’s) are the most efficient because they do not use heat to create light; they use a gas that produces an ultra violet light. These bulbs have a higher color temperature, produce an undesirable blue-ish light, and visually are not particularly pleasing. Until recently, all you could purchase were bulbs that looked like spirals. Now, cfl’s are available in a bulb shape, have more of the desirable yellow glow and can now be used with dimmers and three way lamps. To give you an idea of how much energy you are saving, a “regular” bulb uses 60 watts of electricity, while a cfl “regular” bulb only uses 13 watts of electricity. Do not forget about corners of a room and fill them with light! Now that you know what types of bulbs to use, consider using a floor plant in the corner of a room, put a cfl up light on the floor under the leaves, and then set the light on a timer. When the general lighting in a room has disappeared at dusk, activate your timer. The appearance of this accent lighting at night shining through the leaves and bouncing off the ceiling and adjacent walls will create a dramatic effect. When placing lighting in a bathroom near the sink to illuminate your face, consider the light source coming from the sides, so the light falls on either side of your face. Even consider using a pink bulb, your skin tone will look great. Overhead lighting over a sink in a bathroom is very harsh and creates dark caverns on the face.